Opposition Leader Don Polye has blamed the current National Alliance Party leader for the fall of Somare Government. 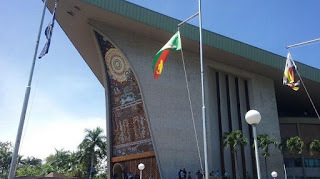 Polye said on record, NA Party Leader Patrick Pruaitch was the main architect behind the fall of the Somare regime on August 02, 2011. Sir Michael Somare was the parliamentary leader of NA during his two terms of reign as the prime minister. "When Grand Chief Michael Thomas Somare was hospitalised for heart surgery in Singapore then all the funds parked in several trust accounts were slowly disappearing,” Polye claimed. Polye said that was why he defected from the government and joined the Opposition. Meanwhile, Pruaitch told Loop PNG that the allegations raised by Polye were incorrect. He said Polye was the main player behind installing the current government. “He left the (NA) Party, and got the majority of National Alliance MPs from the Highlands and New Guinea Islands Region to form the current government,” Pruaitch said. He added that funds were kept in trust accounts to protect them. “He got all facts wrong,” Pruaitch said, referring to Polye’s claim of abuse of funds in trust accounts.